Speedy Ortiz is among the local bands that will be performing at the South by Southwest music festival. Some of the most interesting and innovative folks in film, media, and music head to Austin, Texas, this time of year for the South by Southwest Conference & Festivals. 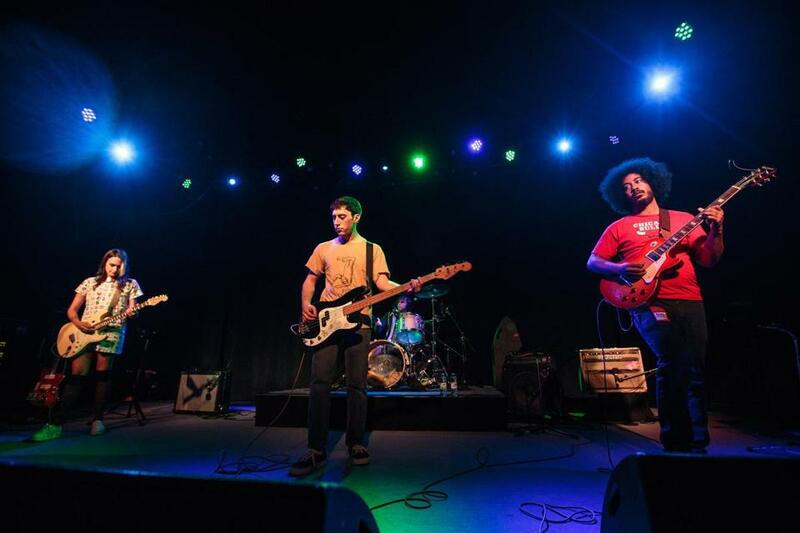 On the music side, the local scene is well represented; among the hundreds of bands performing at the music festival March 12-18, more than a dozen acts are from Massachusetts. “It’s impressive to see the number of acts from the Boston area double this year, not to mention the diversity and quality of them,” James Minor, general manager of the SXSW Music Festival, told the Globe via e-mail. Here are the 13 local bands that will represent the Mass. music scene this week. LuxDeluxe, which started in a Northampton basement, has been named a band to watch by Pitchfork and has released two full studio albums. Listen to them if you like a slower-paced rock and a vintage feel (all of their songs on the album “Let’s Do Lunch” were tracked with vintage equipment). The lead singer of another Northampton band, Sun Parade, Chris Marlon Jennings, started by busking on the streets. Jeff Lewis, after a semester at Berklee College of Music, joined the band and the now five-person group is on tour. Listen to them if you like songs that sound like summer with an ’80s indie influence. Parsonsfield is a rock-based multi-genre band. The group met at the University of Connecticut, started making music in Mansfield, Conn., named themselves after Parsonsfield, Maine, where they recorded their first album, and now call Leverett, Mass., their home. Listen if you like heavy helpings of folk with your rock. Boston-based Vundabar’s newest album is “Smell Smoke.” The indie-rock group is made of Drew McDonald and Brandon Hagen, who grew up in Scituate. Listen to them if you like a rock base with indie, pop, and alternative influences. Returning to the SXSW stage, Speedy Ortiz is a four-member group led by lead singer Sadie Dupuis, who has attended MIT, Barnard College, and most recently received her master’s in fine arts at the University of Massachusetts Amherst. Listen to them if you like smart lyrics, a fun beat, and a strong female lead. Self-taught musician Terence Ryan, from Pembroke, has been to California and back to find his sound. “To Live and Die in New England” off of his album “Don’t Panic” is a soulful song about returning home and a must-hear for his Boston fans. Listen to him if you like an emotionally charged, raw sound and soothing guitar melodies. The last of the Northampton bands, Boy Harsher is a dark electronic group comprising Augustus Muller on beats and Jae Matthews on vocals. Listen to them if you like a good dance beat with a darker feel — think dance Halloween. A married couple originally from Chile, the electronic duo Breaking Forms is made of Nicole L’Huillier and Juan Necochea. They mix Latin rhythms with synthetic sounds, perfect for L’Huillier’s background as a PhD researcher at the MIT Media Lab. Listen to them if you like some indie with your electronic. DJ Costa has already played with some big names in Boston, starting out on Matty in the Morning on Kiss 108. He has also DJ’d for Boston’s most beloved sports heroes at both Tom Brady’s charity event and on Rob Gronkowski’s party cruise. Listen to him if you like extremely danceable beats. Raised in Foxborough, emo-rapper Joe Mulherin calls himself nothing, nowhere. The 25-year-old writes, produces, and performs all his own music, based on his life experiences. Listen to him if you like dark lyrics and a marriage between rap and vocals. Roxbury’s own Vintage Lee, a 21-year-old female rapper, recently released her first 10-song album, “PiMP,” which features a shout-out to her Boston neighborhood. Listen to her if you like slower spoken rap. Mosie — a.k.a. Jesse LeVines and Aidan Brody — is a pop-inspired group from Boston who describe themselves as “Bratwurst bump: a rugged sound, with a bold hip-hop backbone, smeared with crisp, tangy vocals, and luscious synth and guitar lines filling in the cracks.” Listen to them if you like creative lyrics and catchy choruses. Formed by two Pakistani-Americans from Worcester, the Kominas is a four-person punk band that uses music to explore their identity in America, specifically in their most popular song, “Sharia Law in the USA.” They have released four full-length albums and have been featured on BBC, VICE, The New York Times, and more. Listen to them if you like punk drums and vocals with the occasional political spice.